Shanghai, among many cities, was issued a red alert, the highest possible warning. However, state-run CCTV thought it was a good time to put a positive spin on the situation. 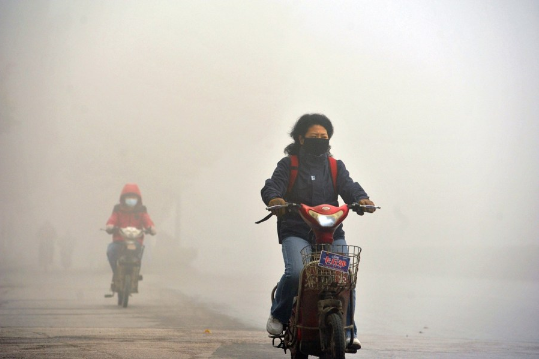 On Dec. 9 CCTV published on its website a list of smog benefits. How thoughtful of them. Citizens must have really enjoyed a good laugh at it. Except, they didn’t. No one is in the mood for a laugh when they can’t breathe. And then there is the question: was it meant in satire, or not? Below is the list of benefits Chinese people are enjoying from the increased air pollution, as summarized in an article on TeaLeafNation.com. The original list was quickly removed from CCTV due to overwhelming ridicule. Yes, complaining about smog is bringing Chinese people closer together. 2. It is making China more equal. Even the filthy rich have to breathe the same filthy air. “Of course,” they can travel in their luxury cars and avoid the worst pollution in other ways, “but they are after all a minority,” and even they “have a hard time” avoiding it completely. “With the whole world playing up the Chinese miracle,” the pollution “reminds us that China’s status as ‘the world’s factory’ is not without a price.” It’s just a wonderful opportunity for people to realize the price of break-neck industrialization. 4. It makes Chinese people funnier. 5. The smog is making Chinese people more knowledgeable. The story has disappeared from the major media outlets that had featured it, such as CCTV’s website and the state-run Xinhua, but it was too late to stop netizens from spreading it, and mocking it, far and wide on social media. It turns out that Chinese people prefer to joke among themselves and leave the media to covering what the Communist regime is or isn’t doing to solve the problem.